Just shaking the hand of the President of the United States is pretty cool. To have a personal meeting with the president, like 13-year-old Vidal Chastenet, is life-changing. 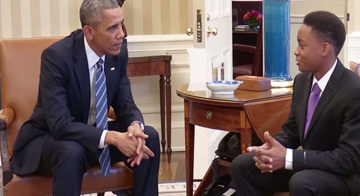 Watch as a student, his principal, and Humans of New York photographer Brandon Stanton meet with President Obama in the Oval Office. The conversation is brief, but topics including overcoming obstacles and seizing opportunities. Any high school student could learn from President Obama's simple message. What challenges do you face on the road to college admission? We would love to hear your comments below.